Main Menu Home Info - Summer Camps - Guitar Lessons - Piano Lessons - Voice Lessons - Drum Lessons - Violin Lessons - Other Instruments - Newsletter, Articles - Testimonials - Tuition & Policies - Gift Certificates - About Us Locations - Allen, TX - Beaverton / Portland, OR - Bellevue, WA - Bothell, WA - Everett, WA - Kirkland, WA - Lynnwood, WA - Little Elm / Frisco, TX - McKinney, TX - Plano / Dallas, TX - Redmond, WA - Newcastle / Renton, WA Teachers - Our Teachers - Teacher Login - Career Opportunities Students - Calendar / Closures - Cancel / Reschedule - Concert Signup - Concert Videos - Book Store Camps - Clothing Store - Music Resources Enroll - How to Get Started - Gift Certificates - Enroll Here! Contact Us! 4/4 School of Music teachers offer Guitar lessons, Piano lessons, Singing & Voice lessons, Drum lessons, Violin lessons and more! You choose the songs you want to learn! All Ages and Beginners Welcome! Children ages five to seven usually start on piano/keyboard or Ukulele, sometimes mixed with fun sing-a-long songs to keep them excited about learning music. Kids can also take drum lessons or violin lessons but these instruments take more discipline to learn at such an early age. 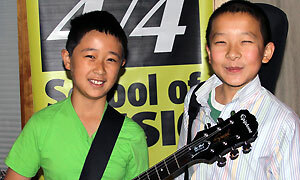 At seven years of age guitar lessons are most popular. 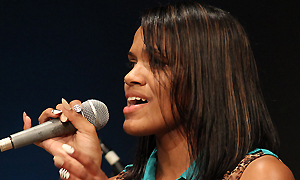 At ten years of age students can take singing lessons and really start to make good progress with their voice. 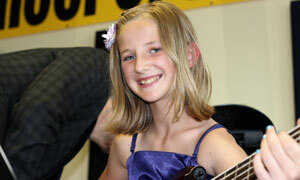 Most teens start taking guitar lessons, singing lessons, drum lessons or bass lessons. These are fantastic instruments to learn because they can start or join a band and play almost any music style from rock and pop to blues, country and more! You can enjoy playing these instruments on your own or with others until you are well into your 90's and beyond! Nearly a third of our students are adults! Half of those are complete beginners. Most adults learn much faster than the kids do! So quit telling yourself it's too late. Having fun while learning and performing is what we are all about. Adult students are encouraged to participate in many student concerts each year! Performing is optional. No pressure, no worries, just fun! Kevin is an awesome teacher. He couldn't do a better job. Harlowe loved her first lesson. Thanks for making all this so easy and accessible! Please tell Kate how much I enjoyed having her as a teacher. She's an amazing young woman. It has been a pleasure working with all of you. I've improved dramatically with Michael's help! So thank you for having such a wonderful and patient staff! Justin is funny, thorough, organized, upbeat, and my son comes out of his lesson every week 3 feet taller. This teacher deserves a medal! Music Lessons for Guitar, Piano, Voice, Drums, Violin, Bass & More! Guitar is a fantastic instrument for ages seven to adult. It doesn't matter if you are into rock, jazz, country, blues or classical. Guitar is the perfect instrument for all of these styles and more! Your five year old will have more fun learning ukulele for a year or two before switching to guitar at age seven. A ukulele is so much easier for them to play and hold at that age. Their experience on Uke will transfer over to guitar perfectly. Piano is the easiest instrument to start with. It is the most visual instrument and easy to learn at any age. 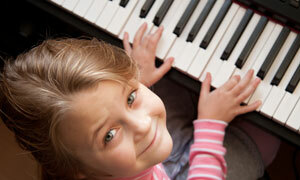 Playing piano is the perfect way to start learning music if you are unsure about which instrument you want to play. Most people start with inexpensive digital keyboards for a few years before purchasing a more expensive acoustic piano. We can help you choose an excellent inexpensive keyboard if you need help. No problem at all! Voice lessons and Singing lessons are the same thing. For Adults the sky is the limit as far as learning to sing. Contrary to popular belief almost no-one is truly tone deaf. The vast majority of us just need training to become good singers. Children must be careful not to sing too hard, too high or too low to avoid damaging the vocal chords. For young children we offer music for kids lessons that are a fun combo of sing-a-longs, piano, rhythm & music learning games. Drums are a very special instrument. To be a good drummer you must repeat the same patterns over and over until you can keep a steady beat. Many kids are just natural drummers. If your child is always banging away on things and isn't afraid of repetition, congratulations, you have a drummer on your hands. 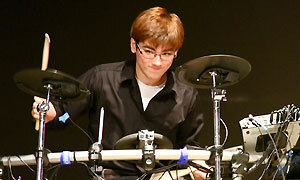 Embrace the rhythm in your home or apartment, let him/her start on an electric drumset with headphones at first. We can help you find one at an affordable price if you wish. We are happy to help! Violin is one of the most beautiful instruments ever made. We can teach you how to play violin or viola the right way. Proper technique is critical to your success. Children have to have a violin that fits them. No other instrument has as many different sizes. Make sure you speak to your music teacher before you purchase or rent the wrong size violin! Because children grow so fast, most parents choose to rent a violin so they can easily trade-up to a larger size as their child grows. Bass, Flute, Clarinet, Banjo, Mandolin, Cello and more! 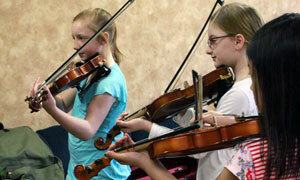 Many of our school locations also offer lessons for Bass, Flute, Clarinet, Banjo, Mandolin, Cello and more. Please call us to locate a teacher for one of these instruments! Enter your email and click the envelope.